The unmistakable form and fresh colors of the bold Pure Komachi 2 range immediately captivates the eye. The knives of the Pure Komachi series bring colour into play. On a visual level, these colourful knives are distinguished primarily by their coloured coatings. The stainless steel blades, covered with a colorful non-stick coating are not only cleaned easily, they also offer optimal cutting comfort for right- and left-handed persons by their high-quality polypropylene, ergonomically formed handles. They also add significant value in terms of removing cut material from the blade, especially when combined with their coloured, non-stick coating. Each knife is assigned its own colour, which allows for an easy overview. 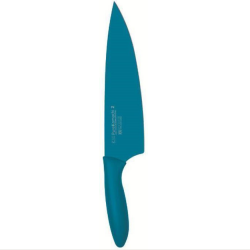 The ergonomic plastic handle is always tailored to match the coloured coating of the blade. The Pure Komachi 2 range is an ideal present for trendy cooking fans. The blades of the Pure Komachi 2 series are made of corrosion-resistant stainless steel and are coated on both sides with a coloured non-stick layer. Utility knife.Overall length: 21.5 cmHandle length: 11.5 cmBlade length: 10 cmBlade:&..
Utility knife.Overall length: 26.5 cmHandle length: 11.5 cmBlade length: 15 cmBlade:&.. Vegetable knife.Overall length: 26.5 cmHandle length: 11.5 cmBlade length: 15 cmBlade.. Chef's knife.Overall length: 31.5 cmHandle length: 11.5 cmBlade length: 20 cmBlade:&n..
Santoku is Japanese for: three advantages. The Santoku is the traditional Japanese shape for a unive.. Bread knife.Overall length: 31.5 cmHandle length: 11.5 cmBlade length: 20 cmBlade:&nb..
Slicing knife.Overall length: 34 cmHandle length: 11.5 cmBlade length: 22.5 cmBlade:&..